A prequel/spin-off to the popular 'DESPICABLE ME' animated film series. 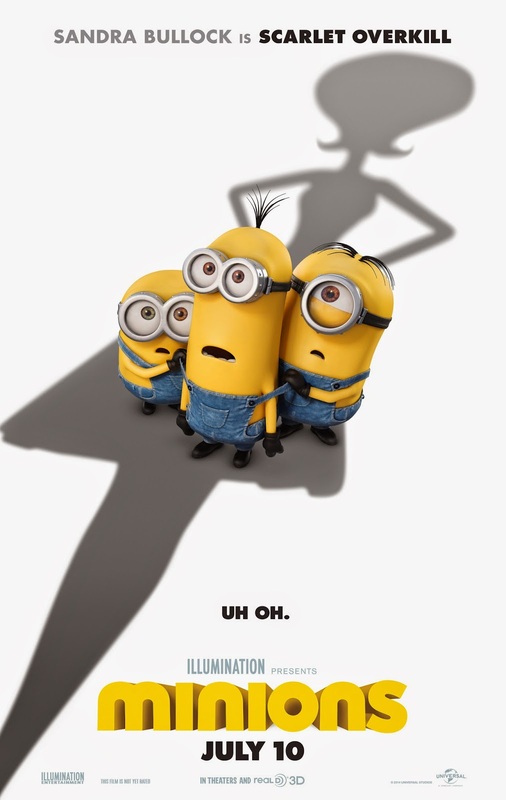 It tells the origin story of the super-villain Gru's little minion helpers. The film was directed by Pierre Coffin (who also co- directed the two 'DESPICABLE ME' movies) and Kyle Balda; Coffin also voices all of the minions, in the film. It was written by Chris Meledandri and Janet Healy and costars the voice talents of Sandra Bullock, Jon Hamm, Michael Keaton, Allison Janney, Steve Coogan and Geoffrey Rush. The film is pretty silly, and rarely funny, but it's probably an OK kids' film. The story starts at the beginning of time, when the minions were first born; as single-celled yellow organisms. They evolved into little naive creatures, with just one passion; to serve the most despicable master they could find. After killing every villain they've ever met, they go into hiding in Antarctica. But after years of depression, three minions (Kevin, Stuart and Bob; all voiced by Coffin) decide to venture out into the world, to find a new master. They meet Scarlet Overkill (Bullock), in Orlando, and find a purpose to live again. The movie is probably the kind of stupid cartoon I would have liked as a kid, but it's painful to watch as an adult. Most of the jokes are really stupid and there's no really likable characters to root for (just the minions). A few moments are funny, but it's definitely not as good as either 'DESPICABLE ME' film (which I'm not a big fan of either). Kids will like it though.